The M48T08/18/08Y TIMEKEEPER®RAM is an 8 K x 8 non-volatile static RAM and real-time clock which is pin and function compatible with the DS1643. The monolithic chip is available in two special packages to provide a highly integrated battery-backed memory and real-time clock solution. The M48T08/18/08Y is a non-volatile pin and function equivalent to any JEDEC standard 8 K x 8 SRAM. 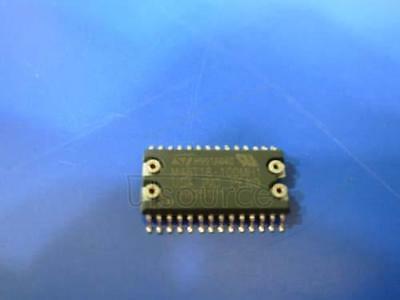 It also easily fits into many ROM, EPROM, and EEPROM sockets, providing the non-volatility of PROMs without any requirement for special WRITE timing or limitations on the number of WRITEs that can be performed. The 28-pin, 600 mil DIP CAPHAT™ houses the M48T08/18/08Y silicon with a quartz crystal and a long-life lithium button cell in a single package. The 28-pin, 330 mil SOIC provides sockets with gold-plated contacts at both ends for direct connection to a separate SNAPHAT® housing containing the battery and crystal. The unique design allows the SNAPHAT®battery package to be mounted on top of the SOIC package after the completion of the surface mount process. Insertion of the SNAPHAT®housing after reflow prevents potential battery and crystal damage due to the high temperatures required for device surface-mounting. The SNAPHAT®housing is keyed to prevent reverse insertion. The SOIC and battery/crystal packages are shipped separately in plastic anti-static tubes or in tape & reel form. For the 28-lead SOIC, the battery/crystal package (e.g., SNAPHAT®) part number is “M4T28-BR12SH” or “M4T32-BR12SH”.